From left to right: AMRO Chief Economist Dr Hoe Ee Khor, Malaysia Minister of Finance YB Tuan Lim Guan Eng, AMRO Lead Economist Dr Sumio Ishikawa, and AMRO Economist for Malaysia Ms Diana del Rosario. SINGAPORE, February 1, 2019 – Malaysia’s economy remains resilient despite the ongoing fiscal consolidation and various external headwinds such as the slowdown of the global electronics cycle, lower crude oil prices, and the U.S.-China trade tension. This is according to the preliminary assessment by the ASEAN+3 Macroeconomic Research Office (AMRO) after its Annual Consultation Visit to Malaysia from January 22 to 30, 2019. The mission was led by AMRO Lead Economist Dr Sumio Ishikawa, and Chief Economist Dr Hoe Ee Khor participated in the main policy meetings. Discussions centered on the implications of the revamp of fiscal management, risks to financial stability and the external positon, spillovers from the U.S.‑China trade tension, and the reforms needed to attain a more inclusive economic development. Following the change in government last year, the fiscal management has been revamped. The budget deficit targets for 2018 and 2019 were revised higher to incorporate provisions for the outstanding tax refunds and unbudgeted commitments under the previous government as well as the one-off special dividend from Petronas. Notwithstanding the revision, the fiscal stance is assessed to be contractionary in 2019, reflecting continued fiscal consolidation. The government’s commitment to increase the transparency, accountability, and efficiency of public finance, while resolving to carry on with fiscal consolidation, is highly commendable. The 2019 Budget reflects efforts to cut unnecessary spending, review the cost structures of government contracts, and reform the existing subsidy and social assistance schemes to make them more targeted. Planned fiscal initiatives should proceed. These include the passage of the Fiscal Responsibility Act and Government Procurement Act, full disclosure of the government’s assets and liabilities and fiscal risk assessment, adoption of accrual-based accounting system, and the establishment of a Debt Management Office. However, the narrow tax base could hamper fiscal consolidation efforts in the medium-term. In this regard, the expansion of coverage of the sales and services tax, the launch of the Special Voluntary Disclosure Program, and plans to tax the digital economy and rationalize fiscal incentives would help to broaden the tax base. Revenue mobilization efforts should aim at reversing the trend decline in the non‑petroleum-related revenue‑to‑GDP ratio. AMRO Chief Economist Dr Hoe Ee Khor and the Malaysia team pose with Bank Negara Malaysia (BNM) Assistant Governor Encik Marzunisham bin Omar (middle) and BNM staff after a wrap-up meeting. Malaysia, like its regional peers, recorded sizeable non-resident capital outflows especially in the second and third quarters of 2018, leaving the ringgit weaker against the dollar. Amid policy uncertainty with the change in government and broader aversion toward emerging markets, ringgit performance was in line with other regional peers. The foreign reserves have also declined although they remain adequate by international standards. However, it would be prudent to build more reserves during periods of capital inflows while maintaining a flexible exchange rate as a buffer against external shocks. Notwithstanding the low headline inflation, monetary policy remains appropriately on hold. Going forward, while the ongoing fiscal consolidation may entail a greater role for monetary policy in supporting growth, it would be prudent to maintain the current policy stance in view of the uncertainty in the external environment and high household debt. The financial sector is generally sound, supported by banks’ significant capital and liquidity buffers, healthy funding profile, stable asset quality as well as sound risk management practices. Nonetheless, authorities should continue to maintain close vigilance on external debt and exposure to the real estate sector. In the face of external headwinds, domestic constraints, and rapid technological changes, there is an urgent need to boost productivity in the drive to become a more inclusive and high-income nation. The authorities are encouraged to accelerate the broad-based set of structural reforms under the Mid-term Review of the 11th Malaysia Plan. In particular, policymakers are on the right track to incentivize the adoption of new technology under Industry 4.0 – especially in the manufacturing sector – and further development of the services sector through the expansion of quality tertiary education and vocational training as well as the promotion of medical tourism. The mission would like to express its appreciation to the Malaysian authorities and other counterparts for their generous assistance and warm hospitality. 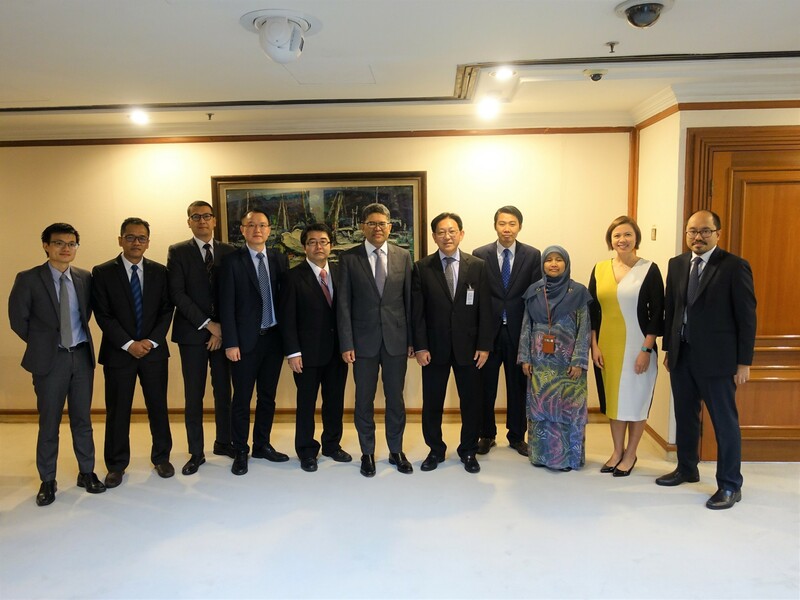 The consultation visit has deepened AMRO’s understanding of Malaysia’s macroeconomic and financial situation as well as ongoing efforts to address the risks, vulnerabilities, and challenges as well as opportunities faced by the economy. ASEAN+3 Macroeconomic Research Office (AMRO) is an international organization established to contribute to securing economic and financial stability of the ASEAN+3 region, which include 10 members of the Association of Southeast Asian Nations (ASEAN) and China; Hong Kong, China; Japan; and Korea. AMRO fulfills its mandate by conducting regional economic surveillance, supporting the implementation of the regional financial arrangement, the Chiang Mai Initiative Multilateralisation (CMIM), and providing technical assistance to its members.